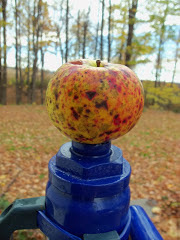 I've received reports from some Whizbang cider-makers that their homemade Whizbang apple grinders are grinding the apples too fine. 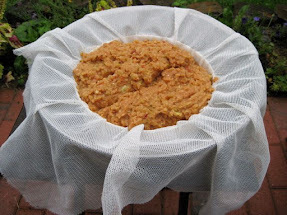 As a result, the apple mash is squeezing right through the openings in the pressing fabric. That's not good! 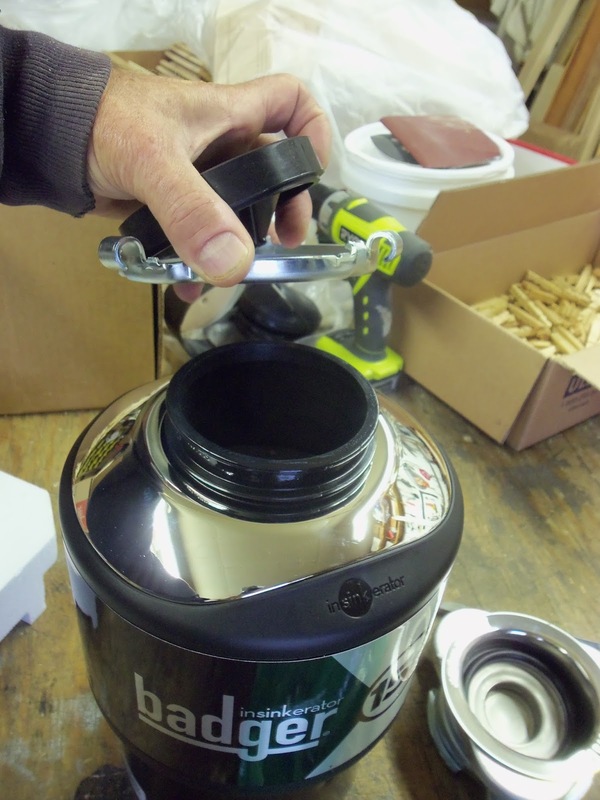 I've looked into this problem and it appears that the high-speed imported disposals are grinding much finer than the InSinkErator Model 80s that I used to make my grinder, and recommend in the plan book. I recently went to a Lowes home center to investigate the selection of disposals. It appears that the InSinkErator 80s that I recommend in my plan book is no longer made. InSinkErator now has an Evolution series of disposals that they are promoting. 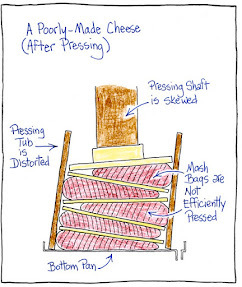 But it looks to me that the Evolution series of disposals are NOT SUITABLE for making a Whizbang apple grinder. They will grind the apples much too fine. 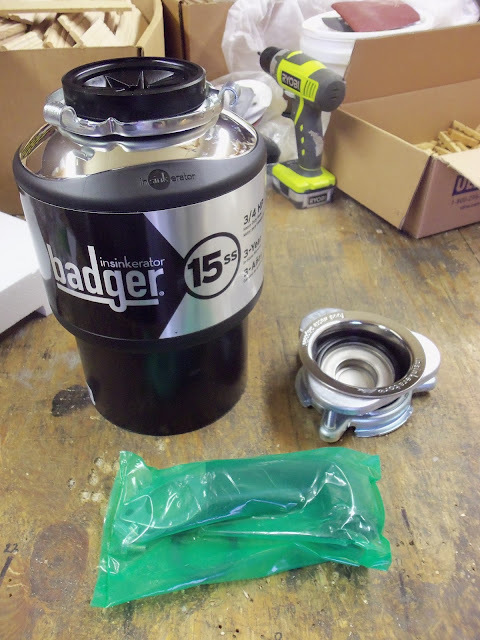 The good news is that Lowes sells a 3/4hp Badger, model 15ss unit (pictured above) that looks to be exactly like their discontinued model 80s. The Badger units used to be InSinkErator's lower-end offerings and did not have stainless steel grinding components. That is still the case, except for the Badger model 15ss. It does have stainless steel grinding components and, like I said, it looks to be just like my 80s. 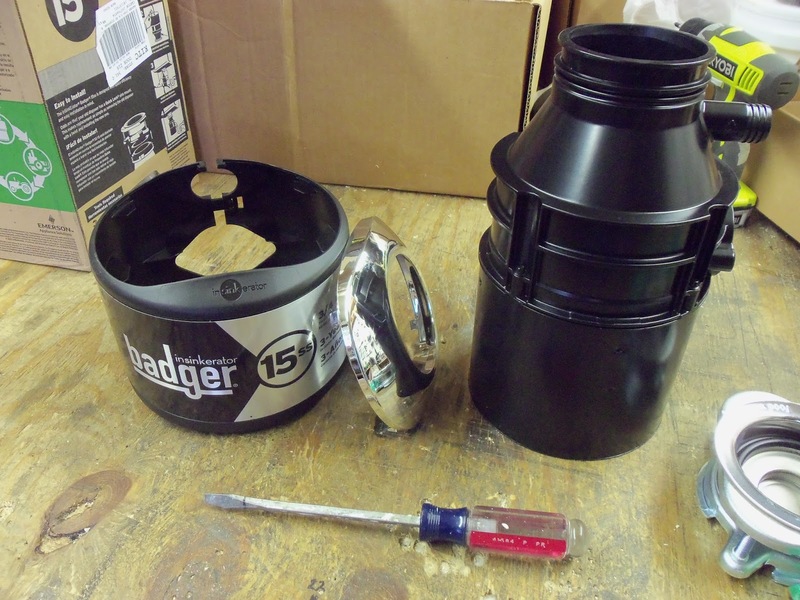 Today I went and bought a Badger 15ss disposal at Lowes and took it apart. It comes apart just like my Whizbang Cider plan book shows. The pictures below give you a disassembly tutorial and I am providing this information as an online addendum to the book. That's the unit. $139 at Lowes. The rubber splash guard and mounting ring come right off. Save for reassembly into the grinder stand later. The plastic shroud pieces will come right off with a screwdriver. 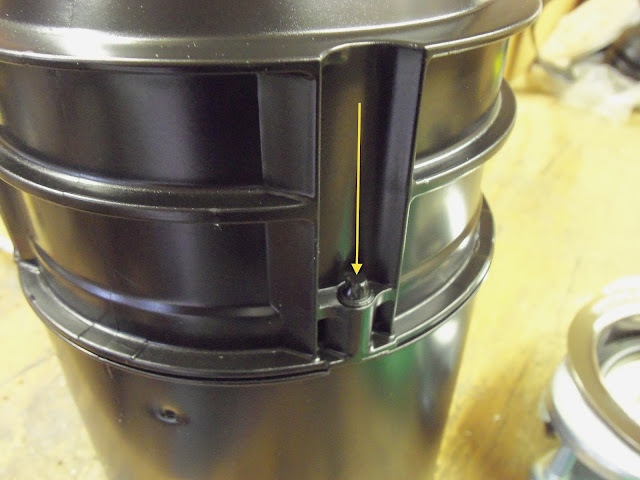 This is a picture of the bottom of the disposal. The four arrows are pointing to four bolts that need to be removed. Click any of these pictures to see an enlarged view. 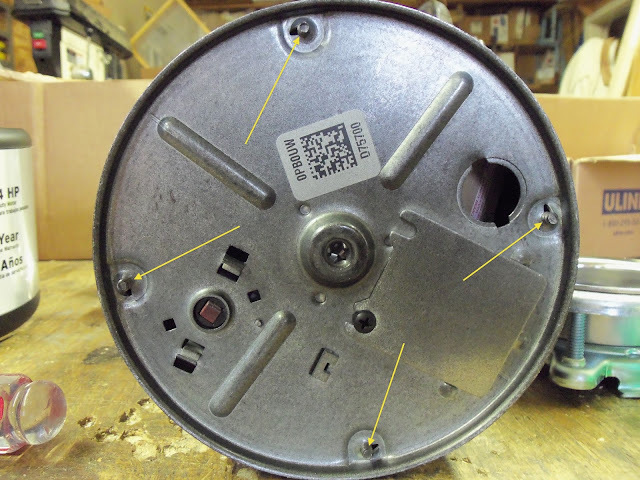 The arrow is pointing to the head of one of the bolts. They come out easily. Note: these pictures correspond with the "Disposal Disassembly" details on pages 24 and 25 of the plan book. 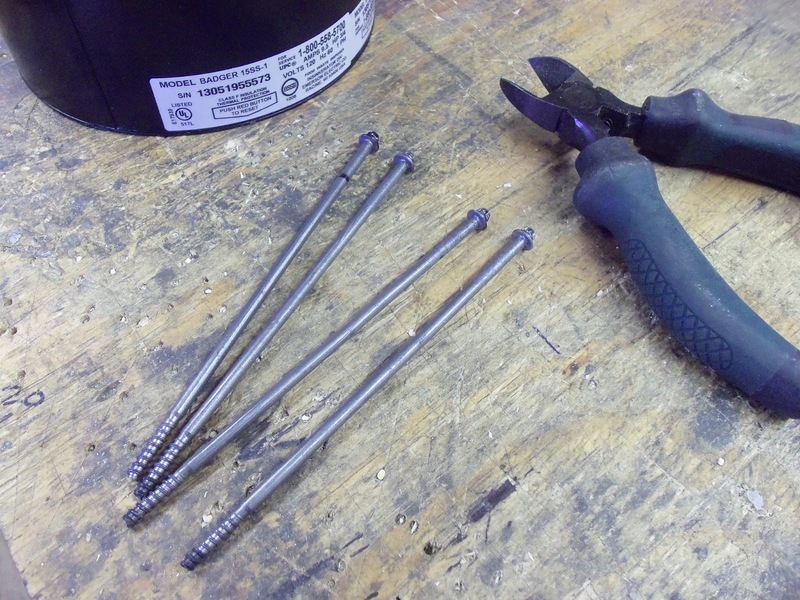 I used those wire cutters to bite into the bolt heads and turn them. Piece of cake. In this picture I have used a screwdriver to pry the top of the grinding chamber away from the bottom. This is not necessary. I have done it wrong. I've broken the butyl rubber seal between the two parts. I should have used my screwdriver to pry where the two arrows come together. 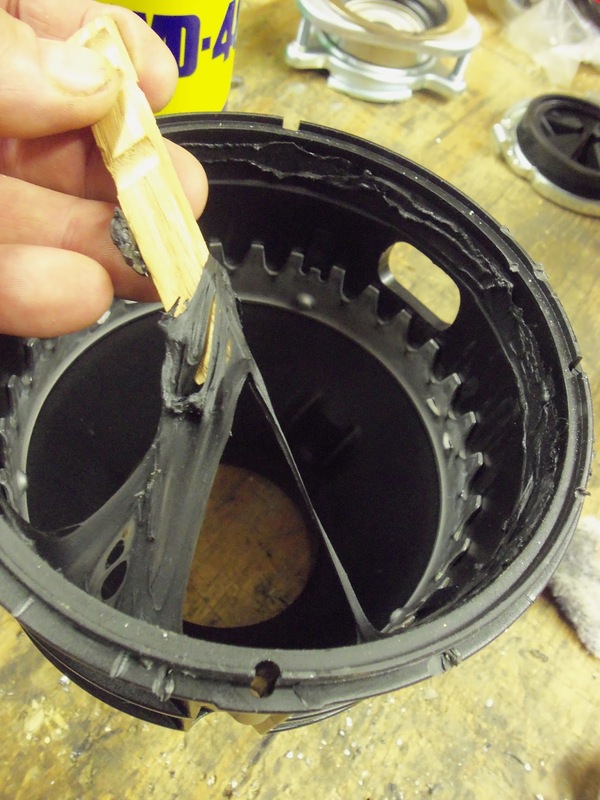 If I pried there, I would have left the grinding chamber intact and separated the stator cover with it's wire windings. It's not a major crisis... I've just made some extra work form myself. 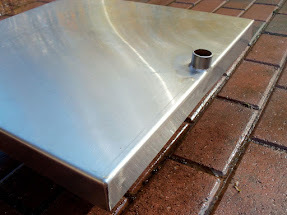 This picture shows the top of the grinding chamber separated from the bottom of the grinding chamber, which has the turntable and grinding lugs. 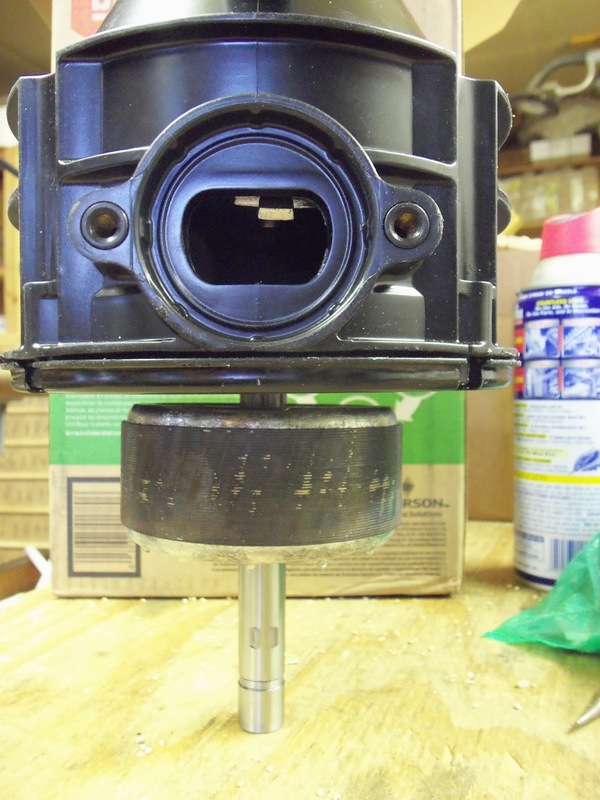 You can see the notched shredder ring in the top of the grinding chamber. See page 19 of the plan book. 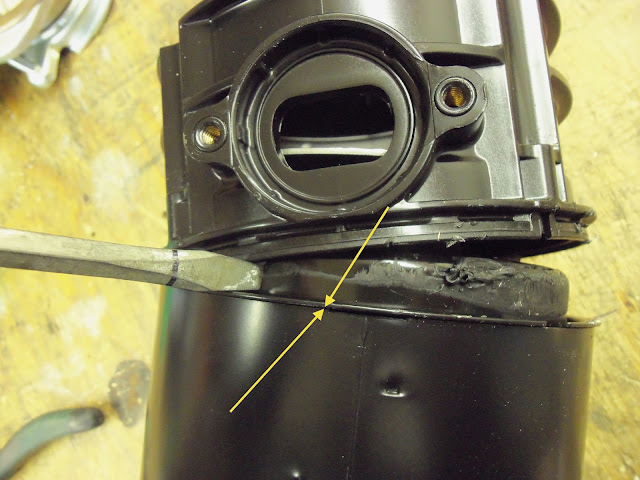 See those two indents in the highlighted area of the motor shroud? 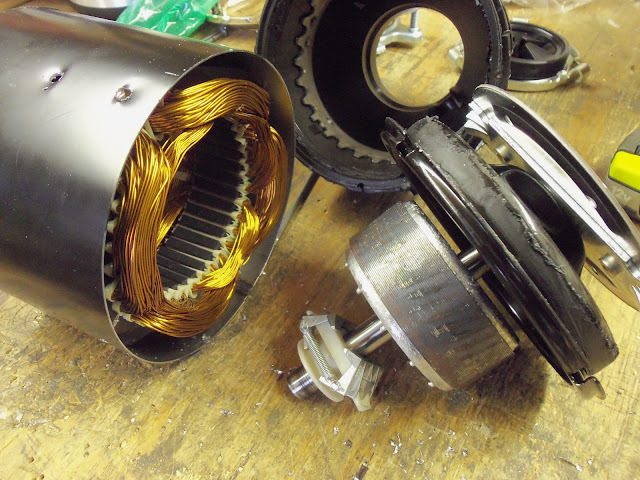 Someone told me that they could not separate the bottom of the motor from the grinding chamber because those indents were holding it. Well, that is not the case. Those indents, hold the wire windings in place under the shroud. The shroud simply friction-fits onto the bottom of the grinding chamber. Here you see the stator and its housing has been pried away from the bottom of the grinding chamber (with a screwdriver). This is what I should have done right after I removed the four bolts. 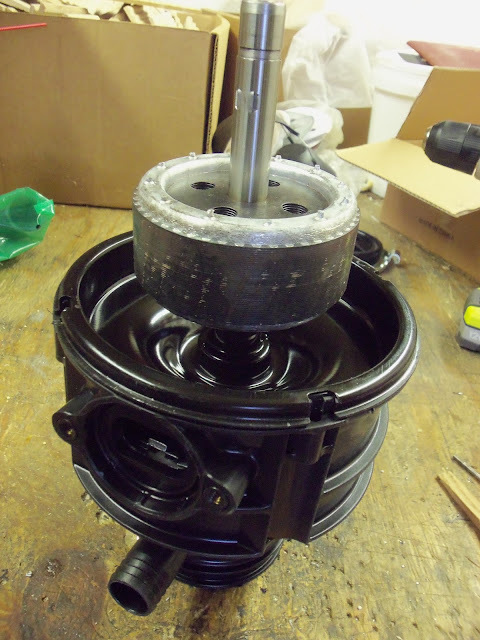 But, because I didn't do that, the upper and lower parts of the grinding chamber now need to be reassembled. 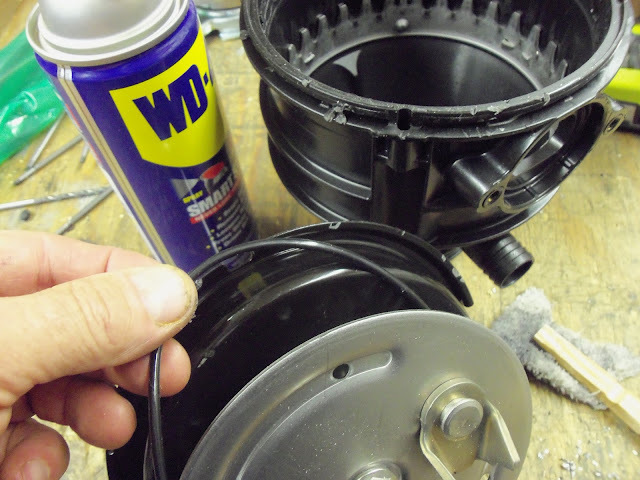 Having broken the butyl rubber seal, the rubber needs to be removed so the top and bottom of the chamber can be reassembled and re-sealed using some 100% pure silicone caulk. I used a piece of clothespin and my fingers to rub off most of the rubber compound, then cleaned the remaining residue with some WD40 on a rag. 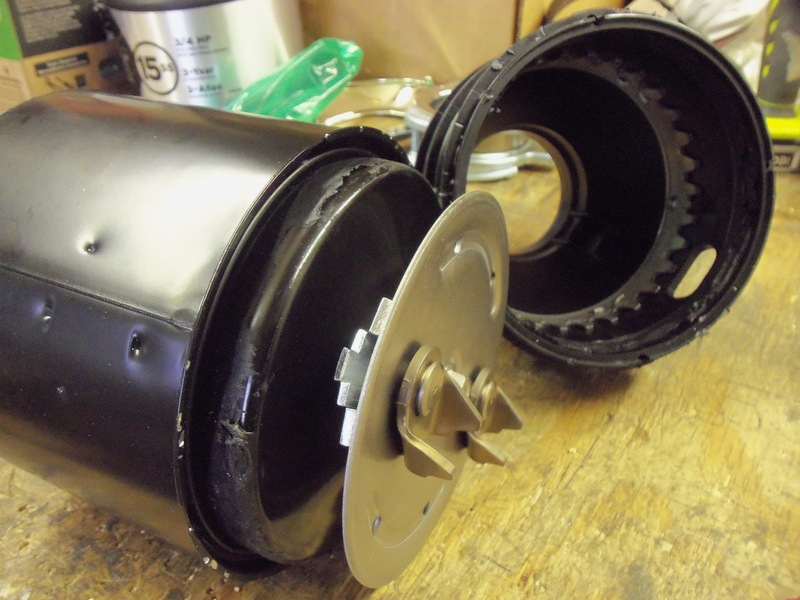 Here you can see the butyl rubber on the bottom half of the grinding chamber has been thoroughly cleaned off. In addition to the rubber, there is a large o-ring (I'm holding it in the picture) that serves as a gasket between the top and bottom sections. 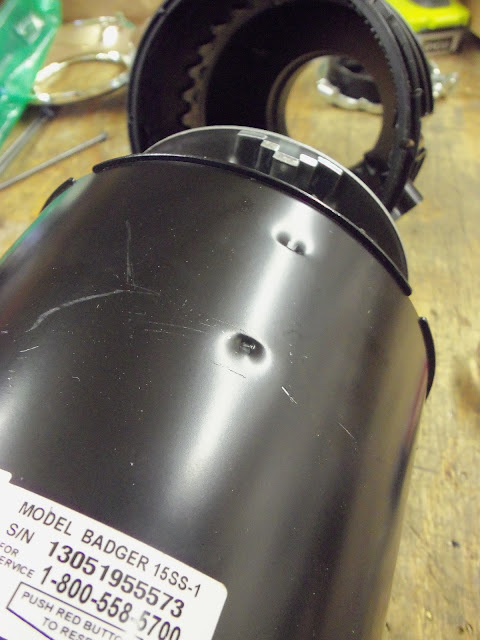 If you take the grinding chamber apart, make sure not to harm the o-ring and get it back in place when you reassemble the unit. Upside-down view of the reassembled grinding chamber. The rotor is permanently attached to the shaft, as shown on page 25 of the plan book. And here it is, upright, ready to bolt into the grinder frame and to attach to the motor, as explained on pages 26 to 28 in the book. 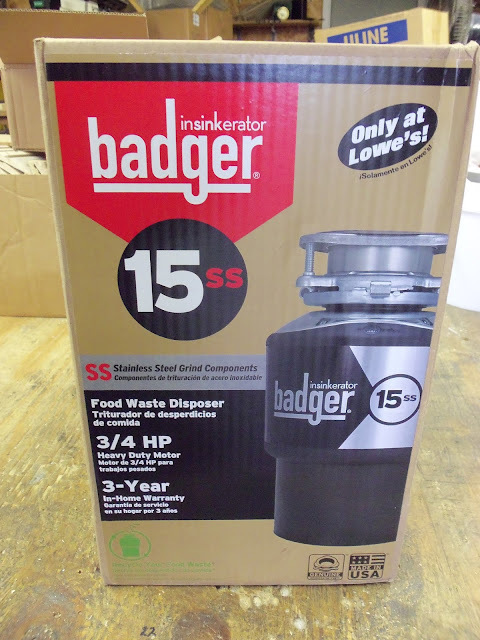 "Just bought a Kenmore 3/4hp disposal part no 60572 on sale for $109 at Sears. 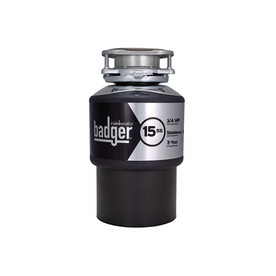 Specs are exactly the same as the Badger 15ss. Normally retails for $139, just like the 15ss at Lowes. Broke it out of the box, removed the (2) spring clips that allowed the plastic shield to come off. Screw driver blade in the correct seam (as illustrated on the WhizbangCider website for disassembly of the Badger 15ss) and a slight twist to separate. Worked the screwdriver around the can and it came off easily. No more than 5 minutes to do this. Sears outlet store may be even cheaper." Click the tub and read all about it. 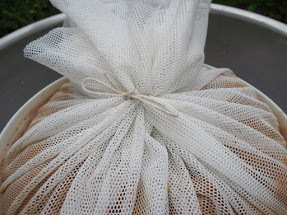 click the picture and learn more about the how to make Whizbang cider. It will cost you $21.95 (the price includes First Class shipping) Click the book to buy a copy right now! 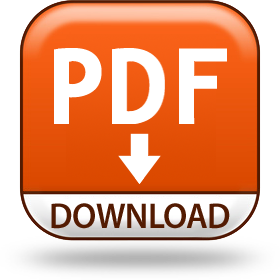 The plan book is now available as a PDF download for only $14.95. Click the PDF image above for details. Click the picture and learn how to make your own! 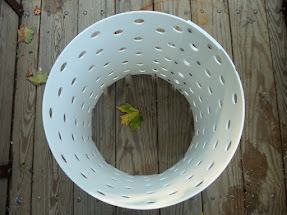 "I have used your plans to build a chicken plucker and a cider press and an apple grinder. Last year was a great apple year here in central PA. I made 160 gallons of sweet cider and 20 gallons of hard cider. Good Stuff!" 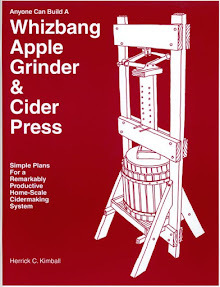 "Last year I bought your plans for the Whizbang apple grinder and cider press. 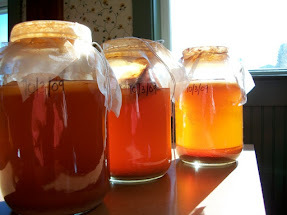 I constructed them both easily and made over 50 gallons of delicious sweet cider!"